Even after 67 years of Independence, India is yet to achieve cent-per-cent literacy, possibly because the Indian education system still reeks of command and control of yesteryear, with students reduced to being shadows of passive knowledge receivers. But as the country heads for a digital tomorrow riding the ambitious ‘Digital India’ programme, it is time to set right all that has plagued the education system since decades. It was in this backdrop that Prime Minister Narendra Modi, in his Teacher’s Day address to millions of children, teachers and parents, spoke of the need to harness technology for taking education to the farthest corners of the country. The remarks couldn’t have been better-timed, as there is a growing stress on spread of literacy, with special focus on education of girl children. After all, the process of nation building has its roots in education and skill development. Continuing with its eight-year exercise of tracking emerging trends, challenges and competition in education and ICT sector, digitalLearning organised the 4th World Education Summit 2014 on 6th-7th August. The event saw high-level of participation of decision makers, educationists, practitioners, heads of educational institutions, eduprenuers and corporates across the country and abroad. Several noted personalities in the education sector presented their perspective on the current education scenario and the vision for the future. The common goal seemed to echo across boundaries the need for a universal effort to move closer towards a world of inclusive, collaborative and quality education. A remarkable high point of the fourth edition of WES was the special inauguration by Union Minister for Minority Affairs Dr Najma Heptulla and her address to WES delegates. The inaugural session, held in association with the National Commission for Minority Educational Institutions, highlighted the opportunities, challenges and achievements in the field of minority education. This was first-ever conference on minority education in the recent years. The World Education Summit is a beginning of our endless journey towards building a platform for exchange of excellence and innovation in the knowledge sphere. I take this opportunity to thank all our participants, speakers, supporters, sponsors, exhibitors, and delegates for helping us make this Summit a memorable and an enriching experience. 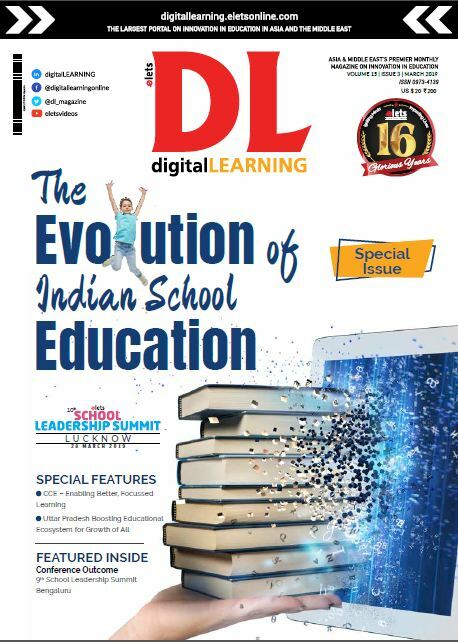 This edition of digital Learning also features the challenges of IT enabled learning in higher educational institutions as the lead feature. We have engaged some leading vice- chancellors across the country for their viewpoint. In a few days from now, India will celebrate the festival of Navaratra. This time round, while paying obeisance to Goddess Durga, let’s not forget to pledge for the empowerment our ‘little Durgas’ – the girls. For, an educated boy takes care of his family, while an educated girl takes care of the generations to come by educating them.